Performing a gap analysis starts before you begin building any rules in your application. Identify the organization's requirements and objectives for the application. Demonstrate the features of the Pega application. Capture the differences between 1 and 2. These differences, or gaps, represent the areas that need to be configured in your implementation of the Pega application. After you identify the differences, you can create a plan for configuring the application to meet your specific business requirements. For more information about how to manage the work to configure and deliver your application, see Implementation Methodology and DCO. The New Application wizard is the starting point for configuring your implementation of the Pega application. Use the New Application wizard to create either an express application or an enterprise application. Unless you need only a subset of a feature or are demonstrating basic features of the Pega 7 Platform, create an enterprise application. When you create an enterprise application, this wizard guides you through configuring the organizational hierarchy, capturing business requirements, and identifying which case types and data types to use from the Pega application. After completion, the wizard creates rulesets, case types, and data types in the implementation layer of your application. You can override the default behavior of the Pega application in your implementation layer rulesets. Your Pega application contains several case types and processes that are specific to your industry. You also have case types that are unique to your business. Review the existing case types by using the Case Type Explorer to determine if the application already provides the case types you need. Design a new case type if the case type required is not already present in your Implementation layer. You can leverage the Dynamic Class Referencing (DCR) pattern to extend your Pega application case types, processes, and data model without creating new versions of these rules. For hands-on practice using DCR, see the Dynamic Class Referencing lesson on Pega Academy. Your application comes with a robust data model to reflect the data entities for your industry. This data is represented as data types in your Pega application. For example, Account is a common entity for many applications. You probably have additional fields that you need to add to the Account data model and data types specific to your business. Review existing data types by using the Data Explorer and Data Designer. Add fields to an existing data types, if necessary. Add new data types, if necessary. In many cases, your Pega application is not the system of record. For example, your organization probably has an established system to store customer account information. Your Pega application connects to that system to provide the data your application needs to move a case to a resolved state. The Pega application gathers data from external systems by using data pages in conjunction with either report definition rules or connector rules (such as Connect-SOAP), and maps the data to your application. Your Pega application provides several predefined data pages to handle the retrieval and temporary storage of data needed to support the case types in your application. Use the View external data entities option on the Data Explorer to find all application data types and the source systems they use. Your organization most likely has a standard for the look and feel of your application. The Pega 7 Platform user interface tool kit helps you configure the user experience based on your organization's requirements and standards. See the User interface overview to get started with Pega 7 Platform UI basics, such as how to skin your application to meet your organization's UI standards and how to use the Live UI tool to identify user interface elements on the current page. End users also have the ability to personalize their dashboard. This means less portal configuration for the architect. Your organization might also have specific requirements for the mobile user experience. Pega Mobile offers multiple options depending on your business requirements. See the Pega Mobility page for more information such as choosing the most appropriate mobile strategy for your organization, how to custom brand your mobile app, and how to configure offline usage of your mobile application. You can also enable push notifications on your mobile device. This is a common feature request for applications with heavy mobile usage. Your Pega application provides several reports for you to leverage as is, or to customize to meet your specific requirements. To list the reports that your Pega application provides, use the Report Browser in the Case Manager portal. For more information about configuring reports for your Pega application, see the Reporting help topic. Many organizations use techniques, such as single sign on, to avoid the need to maintain user credentials in multiple applications. You can configure your Pega application to support the single sign on model and to create and maintain operator records automatically. 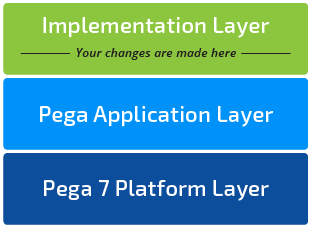 For more information about the authentication options that the Pega 7 Platform supports, see Authentication Services. The Pega 7 Platform provides access groups, roles, and privileges to provide fine-grained access control in your application. For example, you might have a requirement that only managers see an Approve button. You can configure this type of security by using the Access Manager tool in the Designer Studio. For information about all aspects of securing your application, see the Security overview article. After you finish developing your application (or at least the initial portion of it), you can move your rules to your testing and production environments. Use the Application Packaging wizard to help you select the rules and data instances to include in your Rule Admin Product (RAP) file. Use the Import wizard to import your RAP into the target environment system manually. The Pega 7 Platform also provides a command line utility and the Product Migration Wizard for importing rules to the target system in a programmatic way. Read the Implementation Guide for your Pega application. This guide steps you through the specific configuration needed for your application. Enroll in the Pega Academy course for your Pega application. This course provides you with the opportunity to get hands-on practice with the Pega application. Bookmark this article for quick reference.